In addition to the core and supplementary curricula, Asnani School attempts further contribution towards learning outcomes through its value-added curriculum. 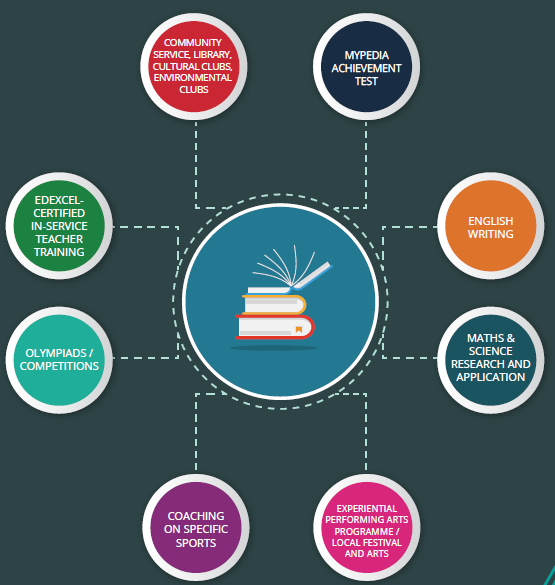 The curriculum comprises a set of innovative programmes for academic, cultural and co-scholastic progress. The 15 Books Campaign has been designed with a simple agenda for encouraging students to read more. The campaign has specific guidelines to ensure the creation of a universal reading culture. students to collaborate and create original texts, critically appreciate them and explore writing as a hobby and possible career option. Mapped to the Indian curriculum and learning standards, the MyPedia Achievement Test introduces reliable and valid means to measure students understanding and skills across scholastic areas. An academic world championship based on Maths and Science, this event is open to high school students around the world; It is held in a different country each year. Participants are drawn from 5 continents and more than 100 countries. Seen more as a competition than as an assessment, it identifies and encourages students who have an abiding interest in Maths and Science. The School offers training in various dance forms. Students also have access to music classes taught by professionals.